The first time you visit London, or any new destination, the question asked isn’t usually what attractions should be scene but what attraction to see first, what to expect, how to get there, and how much time is needed. We’ve provided tips, advice, and other information about the top tourist attractions in London to help with your itinerary planning. Buckingham Palac e was built in 1705 for the duke of Buckingham. The palace became the royal family’s home in 1837 when Queen Victoria decided that St. James Palace was too old fashioned. Buckingham Palace is open to visitors in August and September when the royal family is away on vacation. When the queen is home the royal flag is flown from the flagpole. The changing of the guard takes place everyday at 11 am. The event, when the old guard is relieved and replaced by the new, draws an enormous crowd. Get there early and try to snag a spot along the gate. Despite all the confusion, don’t give up your spot! The event last a good hour and involves a lot of shouting and marching. Afterwards, many folks walk with the guards through Buckingham Palace Gardens. After calming down from the excitement the gardens are an excellent place to stroll around and enjoy a beverage from one of the many vendors that have setup for the event. To many, London’s House of Parliament and its tower clock commonly referred to as Big Ben, is London’s most famous and recognizable symbols. 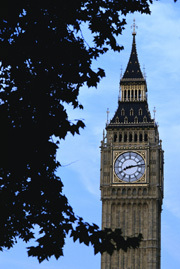 As soon as you step out the door of Westminster Station you will be in awe from the sight of Big Ben. House of Parliament is officially known as the Palace of Westminster. It was built in 1840 and contains over 1,000 rooms and 3 km of corridors. The Palace of Westminster was built in traditional neo-gothic style, which was the sign of the times when it was built. There is a visitor’s gallery for the House of Lords and the House of Commons. The latter is usually more interesting and is where Parliament meets to debate new legislations. The oldest part of the Palace of Westminster is Westminster Hall, which was built in 1099. Westminster Hall served as a courthouse until the 19th century and housed such trials as that of William Wallace and Thomas More. The Tower of London has been the corner stone of southeast London since 1078 when construction of the White Tower began. The Tower of London has a rich and diverse history. It was once a royal palace, a fortress, a treasury and an armory. However, it is best remembered as a prison. Edward V and his younger brother are believed to have been murdered here by their uncle Richard III. The tower is commonly called Bloody Tower. The nearby Tower Bridge is awe inspiring, majestic, and may be the grandest bridge ever constructed. Take a walk across the bridge and enjoy the superb views. In 2003, this was where the American entertainer, David Blaine, lived over the Thames river is a glass box without food for 44 days. Wes tminster Abbey is richer in history then many know. The site actually housed a community of monks dating back to 750 AD. Edward the Confessor enhanced the site in 1050 making it the pride of England’s church and state. The Coronation Chair taht sits behind the main alter is where all of the monarchs have been crowned since 1066. The majority of which are buried there in addition to numerous poets, politicians, and musicians. Princess Diana’s funeral service took place here in 1997. The best way to experience Westminster Abbey is to attend a service. In front of Westminster Abbey and beside House of Parliament is Parliament Square, which is a common locale for protests. You’ll most likely see a number of protest signs perched along the road beside the gardens. Once you have visited the Abbey, it’s nice to explore the streets running between Parliament and the Abbey including Abbey Gardens. You’ll feel a little like James Bond. If you have more then a couple days to spend in London, you owe it to yourself to checkout Stonehenge, England’s most important prehistoric monument. It takes about 2 hours to get to Stonehenge from London. Trains depart frequently from London’s Waterloo Station to nearby Salisbury. Alternatively, you can catch a bus from Victoria Station. Once you get to Salisbury, you’ll need to take a Wilts & Durset bus to Stonehenge, which takes about 30 minutes. The pillars that makeup Stonehenge are surrounded by a rope that you need to stay behind. The surrounding walkway provides an unobstructed view of the mysterious creation. Great for photos. You’ll have to pay a few pounds to enter the grounds but with that tourists are provided with a headset for the free audio tour, which is very insightfull. Touring stonehenge takes at least a couple hours. A bit north is the Onze-Lieve-Vrouwekerk (Church of Our Lady). It took two centuries (13th-15th) to build this spectacular church with its spire that reaches towards the heavens. The Church of Our Lady contains Michelangelo’s Madonna and Child in addition to a number of other masterpieces. If you’d like to turn your excursion into a day trip, Salisbury is a great place to take a break. Further, you can take a stroll past the Salisbury Cathedral, Britain’s finest example of early English style architecture. You’ll also find tons of charming restaurants, great for enjoying a filling lunch and conversing about the eon’s worth of history that you just absorbed.